The RV Doctor: How Fresh Is Your Fresh Water? According to the ancient Greek poet Pindar, "Water is the best of all things." But would Pindar, who lived 518-438 BC, even understand our contemporary RVing concept of carrying fresh water with us, or of tapping into a different source of city water each evening? Certainly there was a high degree of importance placed on the availability and the freshness of water during those ancient times, not to mention the importance of learning the refined art of dry camping; talk about real boon-docking! And so it should be today. RVers should wonder just how fresh, (read - safe), is the water at the various campgrounds we visit. 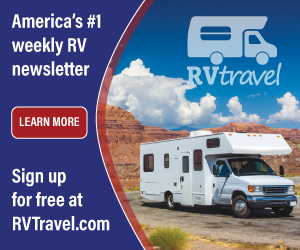 We've all experienced bacteria-causing, foul tasting and smelly water at some time during our RV excursions, but are there more serious dangers lurking below the surface? (pun intended). Just what pitfalls are we to be aware of? Microbiological water enigmas center around five categories; viruses, molds, algae, parasites and bacteria. Specifically, waterborne bacteria and some hearty parasitic protozoa are a serious concern everywhere since the majority of these are often not affected by typical disinfection processes. In fact no U.S. municipal or regional waterworks can guarantee killing or removing all of them. Add this to the fact that the most dangerous of the parasitic cysts, Cryptosporidium, is found in virtually every surface water supply worldwide. Small wonder there should be caution. The very name itself should induce an awareness; "crypto" means hidden or secret and the word "spore" means seed or germ. Cryptosporidium is literally a "hidden germ". A leathery shelled parasite, it is just 3-7 microns in diameter; (a human hair measures 100 microns). Cryptosporidium causes severe, flu-like symptoms and must simply be left to run its course since there is no cure. Once ingested and broken down, four additional protozoa emerge from each cyst and begin to reproduce. As widespread as Cryptosporidium has become, the EPA still does not require municipal water systems to test for it. Yet another good reason to take an assertive stance regarding the water you drink and cook with. One, boil all the water used in the fresh water system - Boiling is a good way to kill bacteria, viruses and parasites though this is not very practical. Two, use bottled water - Again, not very practical for RVers. It can also be expensive, inconvenient and still no guarantee that it's pure. Some published reports even suggest that 25% of all bottled water contains known carcinogens and about 20% contain industrial chemicals. Wonderful. Three, use a point-of-use, (POU), water filtration system. This option is the most viable, the most convenient and the most readily available to all of us. Many fine companies have jumped to the fore with an assortment of effective filtration products. Filtration systems can run the gamut from simple mechanical strainers to the more exotic reverse osmosis and superchlorination systems. The best system for you depends on your traveling habits and the cleanliness of the water you are likely to run into. Many POU systems are installed under the galley sink and deliver fresh water directly to a dedicated faucet for cooking and drinking. However, many RVers prefer the very popular, in-line external units that allow finite filtration without losing that precious under-the-counter storage space. The added plus is that all the incoming city water is processed, so you can enjoy RV showers without the heavy metals and odors sometimes found in park systems. As an additional precaution, use an in-line filter as you fill the fresh water tank on the RV. As water is processed through the filter just before it enters the city water inlet or the inlet to the fresh water tank, sub-micron particles, bacteria, cysts and unwanted chemicals are removed by the active filtering media, usually carbon. So just how does activated carbon remove the impurities? By the process of adsorption. No, that's not a typo. Adsorption is the physical process that occurs when dissolved molecules, bacteria and other particles are attracted to and attach themselves to the surface of the adsorbent, the carbon. Kind of like a magnet sticking to a metal surface. Quite different from the more familiar process of AB-sorption, which can be likened to a paper towel soaking up water. As an adsorbent, especially when filtering trihalomethanes, (THMs), volatile organic contaminates, (VOCs), pesticides and fungicides, activated carbon is quite effective because it's surface area is enormous; about 1,000 square meters per gram. To put that into perspective, a piece of carbon the size of a single pea will yield a surface area a little over the size of half a football field! But as with many good things, there is a downside to using carbon as the sole filtering media. Exposure to chlorine in water supplies will quickly deteriorate the adsorbing qualities of carbon, rendering it minimized or useless in as little as 200 gallons, so if you use a chlorine product to de-winterize your RV water system, be sure to remove or bypass the filter first! As an alternative, companies such as Hydro Life and General Ecology, have improved upon the process of carbon-only filtration. General Ecology has developed a unique technology employing a "Structured Matrix™" filtration component which instantly filters the water without the use of chemicals, double treating or delay time. Hydro Life has perfected a filtering media which employs carbon along with their patented media called KDF. KDF causes an electro-chemical reaction which neutralizes harmful chemicals and dangerous metals such as lead. As an example, chlorine is broken down into a harmless chloride after being zapped with the .04-volts produced when the water passes through the KDF. The water then passes through the carbon to complete the filtering process. An established maker of exterior and interior POU systems, Hydro Life also has developed a unique bracket to hold most external filters. A mounting plate is secured to the sidewall of the RV and a second plate is provided for stowing the filter inside a compartment. The nice feature about this holder is that it can be reversed to hold either the canister-type filter or the in-line version. Other suppliers with a high degree of brand recognition include Everpure® and Culligan®. The popular Everpure system utilizes a superchlorination/dechlorination process to attack bacteria, viruses, cysts, rust and other heavy metals. All of which can lead to foul smelling water. Another name synonymous with RVing is SHURflo®. Aside from their very popular water pump, SHURflo also offers the Waterguard Water Filter Kit. This cartridge-type filter can be mounted inside, under the counter, or used as an in-line, exterior filter. 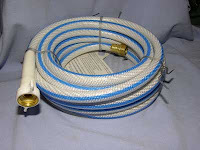 One Waterguard model incorporates a handy bypass valve for easy cartridge replacement or for winterizing purposes. Like the Culligan canister-type filter, the Waterguard replacement cartridges are available with an assortment of filtration media depending on the degree of filtration needed. Look for a filtration system that satisfies the requirements of Standard 53: Drinking Water Treatment Units - Health Effects, as determined by NSF, a third party certifying agency. Though no official standard exists for POU filters, virtually all public health officials adopt the standards of the NSF. To ensure proper filtration efficiency, always replace the filter media or cartridge as least once a year. Keep in mind, the longer a filter is in service, the less effective it becomes. At some point, an exhausted filter media will begin dumping contaminates back into the system. In severe cases or when tainted water has been encountered, it may be necessary to replace the filters more often. Perhaps what Pindar really wanted to say is, "Fresh and clean RV water is really the best of all things!" Well, we, at least, can enjoy that sentiment today. Be sure to check out the filtration devices on your next visit to your local Camping World store.